Some people like to serve pancakes with a garnish of berries. But at The Mission restaurant in San Diego, a creative cook embedded the fruit in the pancake itself. SLICE fresh berries in 1/4-inch pieces. SPOON the pancake batter onto the griddle or pan. ADD the sliced fruit while the batter sets. If you work quickly, you can add them in a circle; but random scatters are just as tasty. No berries? Use dried fruit (dried cherries, cranberries, raisins, etc) or dice any other fruit you have on hand (apples, bananas, pears, etc.). You can also mix up a creative syrup; for example, honey with raisins, diced apples and/or chopped nuts. This is delicious on French toast, pancakes and waffles; along with fruit salad, ice cream, un-iced cakes, etc. Fun with fruit, in and on your pancakes. 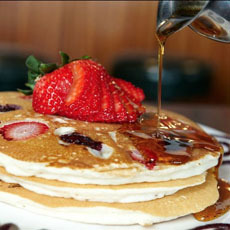 Top: Embedded berries (photo courtesy The Mission restaurant | San Diego). 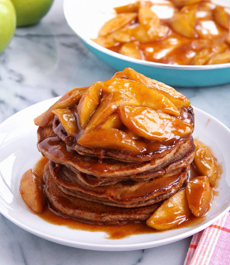 Center: “Apple Pie Pancakes,” topped with sautéed apples (photo courtesy PotsAndPans.com). 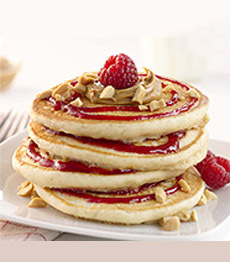 Bottom: Topped with peanut butter and jelly or preserves (photo courtesy Krusteaz). 1. HEAT the water and the sugar in a small saucepan over medium heat until the liquid begins to boil. Reduce the heat and simmer for five minutes, stirring occasionally until the sugar dissolves. 2. ADD the cinnamon and lemon juice, stir thoroughly, and let cool or serve warm.